It is easy for new home buyers to prepare for home-ownership by purchasing furniture, appliances, and other extravagant items. But as a first time home buyer, knowing that making any major purchases after initial approval can affect your qualification status. The mortgage process does not end when you receive your pre-approval letter. 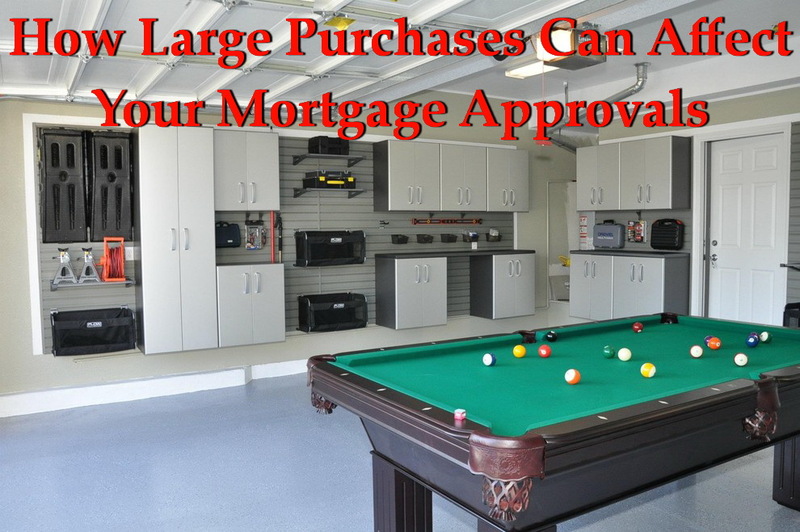 Fortunately, there are a few smart ways to make larger purchases without jeopardizing your home loan approval. How Large Purchases Can Affect Your Mortgage Approvals in 2017. NSH Mortgage has the knowledge and tools to help you make wise choices before your approval. When you apply for a mortgage loan, your lender will look closely at your monthly payments compared to how much you make. This comparison is called your debt-to-income ratio, or (DTI). Lenders usually want to inspect that the amount of your monthly payments do not exceed 43% of your pre-tax income. Financing major purchases will add to the payment side of the equation, increasing your (DTI). A higher (DTI) could result in delays, or in extreme cases, a turned down loan. For instance, a home buyer who makes $5,000 will increase his (DTI) by one percent for every $50 per month in payments he takes on. That is not a big deal if he starts at a low (DTI) of around 35 percent. But if he is already at the limit of 43 percent, additional debt could be a problem. If you are unsure how a major purchase will affect your loan approval, speak to your loan officer beforehand. He or she will try to re-approve your loan file with the new hypothetical payment. Avoid the purchase if the new account changes your approval status. Home buyers do not intentionally put their mortgage approval at risk. Usually, they do not realize new credit accounts will be a problem, or that they are even opening a new credit account. Such is the case with same as cash offers. These programs require zero upfront costs and no payments for a set amount of time. They are usually offered as an incentive to buy furniture, appliances, or any other extravagant items. They can be hard to resist. It can seem better to hang onto cash as you begin your life of home-ownership. Yet these offers are zero interest rate credit accounts for which the creditor will eventually require a payment. Despite the delayed payment requirement, lenders will determine the estimated future monthly bill, and add that to your (DTI). If the proposed payment pushes your (DTI) above 43 percent, the underwriter could have a hard time keeping your loan in an approved status. Paying cash for a major purchase during your loan process seems like a logical option. You avoid opening a new credit account. However, paying cash could put your approval at risk, but in a different way. Many loan programs require you to show a cash, cushion, equaling two full mortgage payments, after subtracting the amount needed for the down payment and closing costs. Depleting your asset accounts could lower your balance below the minimum threshold for approval. Before making a large cash purchase, speak to your loan officer. Find out the minimum amount you need to cover all hard costs and the required cushion. You should only make a cash purchase if you have plenty of room to do so. When Is It Safe To Make A Large Purchase? Your loan is not complete after you receive a commitment letter or pre-approval, or even when you sign final paperwork at the escrow company. Your lender continues to check your financial situation until the bank funds. This is when the bank wires all money involved with the transaction to the escrow company. This usually happens a few days after you sign final loan documents. Your lender will pull a credit refresh on the day of funding. This credit re-check will show the lender any new accounts or even if existing accounts have higher balances. While this last minute check may be intimidating, there is no need to worry if you have not made any large purchases since your loan application. If you have, your lender can still re-approve your loan on the day of funding sometimes, assuming you still meet guidelines. If you want to avoid risk altogether, wait to make a large purchase until you are moved into the home. This is a sure sign that the loan has gone through and the home is officially yours.